OK, I give up. This is not the race to run a 50 mile pr. But is is a race to have a lot of fun sharing a unique experience with a community of wonderful running friends. This year was made more special by having a large contingent from the Raleigh area come down just to offer support. I rode down with two of my Angel team, Lisa and Jenn. We arrived early so I had plenty of time to meet and greet with a lot of friends before getting dressed to run. Especially enjoyed the excitement that the first timers were showing. It was hot and a little humid, near 92 but not nearly as bad as last year and the forecast was for it to be cooler during the night too so I was hoping for at least a strong run. Just before the start there was a storm off in the distance and a breeze kicked up and dropped the temperature several degrees. I hadn't really planned on it but found myself running with Jenn early on. We train a lot together and our easy pace is about the same so it just seemed natural. We spent some of the early miles running with Robert Crosby which was nice. I've seen him at ultra's for many years but never have run with him before. We also had the company of Jimmy Ballard in these early miles. As we made our way to the far side of the first 6 mile loop the road was wet from the shower and now steam was rising from the road and the humidity had become oppressive. We just caught a few sprinkles but as we made it back up to the church, the road was soaked so we had all just missed out on the first storm. Now the skies were clearing and it was just warm and humid. The Surrette kids, Kayla, Drew and Ashlynn were waiting to squirt runners down with there water guns so I let them hose me down before heading down the hill. My plan was to take it a lot easier the first loop this year, so despite feeling pretty good I went ahead and walked just about all of Bethel Church Hill. Finished the first lap about 8 minutes slower than last year and everything was going well. My shirt was doing me no good just being soaked with the humidity so I took it off after letting the kids squirt me again. After a mile or so I began to pull away from Jenn and soon caught back up to Jimmy. We would share the next loop and it was mostly uneventful. As the sun set the moon was out and bright so I was really enjoying having a true moonlight Boogie. However there was lightning in the distance and it seemed another storm might be on the way. We ran a bit of the hill this time but my left foot had been bothering me for a while so I decided to check it out now before it got worse. I have a plantar wart that bothers me sometimes on long runs especially when my feet get wet but there was something else going on. I took off my shoe and saw nothing but when I took off my sock I found a large piece of debris that I had been carrying around since the beginning. Ahhhh, it felt so much better now. I was a little disappointed that I had slowed down from the first lap and knew the pr attempt was not going to happen so I now planned to just run as well as possible and not worry too much with the time. While I was sitting Jimmy had gone ahead and Jenn had caught up and continued on. I was still feeling good overall, legs were great and my energy level was fine so I was able to run well over the next several miles. By the time I hit the dog pen aid station the clouds were now covering up the moon and it was getting dark with lots of lightning flashes getting closer. I finally caught up with Jenn at the church at 26 miles so we started off down the hill together. The rain started about halfway down and by the time we reached the bridge it was coming down very hard. Lightning was flashing all around but it didn't seem to be right on top of us so neither one of us worried too much as we walked back up the hill. We began this loop with the rain still pouring down. I had gotten a little chilly walking and thought about putting on a shirt but it would just be soaking wet and I don't know that it would have helped hold in any warmth so I decided not to put one on just yet. As we began running again though I warmed back up nicely. I was really glad to have Jenn's company at this point. It would be real easy to get discouraged being alone in the dark in the middle of a thunderstorm and it was really nice having her along because in many ways she is a female version of me. We were both fine with the storm and not worrying at all. There were always a few seconds between flashes and thunder so we felt no fear this evening. As we ran down the road though my fear was I wouldn't be able to keep up with her. She was the one pushing the pace now and I must say I would have probably walked a bit more of this loop had I been alone. She is a natural at this ultra stuff and so efficient and consistent in her running style. Just before turning back up to the hill at the church and the 36 mile point I was beginning to feel my energy waning and my head getting a bit out of it. I realized I had not been taking in many calories over the last couple of hours. We stopped at the car long enough for me to grab some gels and put a Nunn tablet in my water bottle before hurrying on our way. By now the rain had slacked off to a sprinkle and the clouds seemed to be thinning. We talked to Lisa while getting ready and was happy to hear she had improved over her time from last year in the marathon. We headed off down the hill but Jenn was running stronger than I wanted and kept pulling slightly ahead. Finally as we reached the bridge I had to let her go. I backed off on the flat section but as I began the climb up Bethel Hill I began to feel better again (amazing what a little sugar to the brain can do) so I was running about half of the time going up the hill. I could see Jenn's light up in the distance and was actually gaining ground on her. With about 1/2 mile to go Laura MacLean ran by strong on her way to her finish and repeat her win. I was so happy for her because she had some knee pain and wasn't sure she could run the whole thing let alone win. Just as I finished loop 4 I caught Jenn in the aid station but she ran on and didn't see me as I stopped long enough to drink 2/3rds of a can of Pepsi. Ahhh it was so good and gave me a boost of energy going into the last loop. I congratulated Laura and headed out into the darkness once again. I was really happy with the way I was feeling and felt I was running as strong as ever. I didn't need anything at the Dog Pen so I just thanked the volunteers one last time as I continued running up the formerly dirt road. Just before I had noticed that the stars were coming out and the moon had set so I was enjoying looking at the skies in the total darkness of that lonely stretch of road. I ran the entire race without a light once again except for the miles with Jenn. By now I had just about enough fun for one evening so I was happy to reach the church and see the cheering squad one last time. I told them I'd see them in a few minutes, I just had one more little hill to go. I was pushing the pace a little now heading down. With only four miles to go there was no reason to save anything. I had not looked at my watch since finishing loop 2 so I had no idea what my time was now. I was hoping to at least get a course pr and go under 11 hours and felt I should be close to that goal considering how much better I felt compared to last year. When I reached the turnaround at mile 48 I looked at my time and saw it was 10:19 so I smiled knowing I had the course pr in the bag. I had not even gotten as far as the bridge when I saw Amy Surrette, another of my Angel team and Charles Akers less than 4 or 5 minutes behind me. Wow, they were really doing great and were moving along at a strong pace. I continued up the hill running about half the time once again and crossed the line in 10:46:05. I was picking out my finishers mug when I was shocked to see Charles and then Amy. I was expecting to wait a few minutes to see them finish but they had killed it coming up and were just over a minute behind me. Woohoo ! 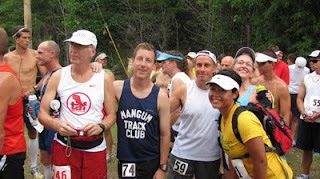 So proud of those two running an amazing time in their first 50 miler and finishing so strong ! Every boogie, even the ones that hurt are fun but this one was great and I have never felt better. What a great venue to hold a special event like this. Boogieman Doug does a wonderful job putting this together and the volunteers that come out in all kinds of weather to spend the night helping a bunch of crazy runners are awesome. Enjoyed your report. It was my first 50 and a tough one for sure. The rain was something else. Inspiration!! LOVE reading you blogs, they are amazing! You are so correct that this is such a great venue for an ultra. Doug does an amazing job and people just keep coming back despite the pain they place on themselves. Congratulations on your PR and it was great to see you running well. Nice Joey! Great seeing you out there! Hey Rick. thanks for the support from you and Tammy. wish there had been more time to hang out with you guys. I'll be seeing you at iron Mt. Great Report on the race! Congrats on the course PR! I watched your video and that was really cool as well. You are amazing athlete with a very humble and chill attitude toward running i really felt honored to be part of that race. keep it up !!!! !